Egypt is a good country for shopping, because it's cities have wide range of markets where they sell some of the most typical products of the country. The largest and best known of all is the Khalili, located in one of the oldest areas of Cairo. Through its narrow streets you can find many stalls with traditional shisha, poufs, carpets, ceramics, paintings, perfumes and clothing of all styles. The most sought-after purcase, however, is the djellaba, the typical Egyptian costume that is made up of a tunic of different colors and embroidery. Goldsmithing is one of the trades with the longest tradition in the country, as well as the classic papyri with engravings of hieroglyphics . The most advisable thing is that, in both cases, that you purchase these items in places that offer a guarantee of authenticity. There are numerous factories and workshops that can be accessed by taxi or on a private that offer quality pieces. Also called hookah, shisha is the container of metal and glass that is used to smoke flavoured tobacco. It is a habit deeply rooted in Arab countries, so in addition to being able to find it in numerous restaurants and tearooms, this product is also available to buy in almost all stores in the country. There are different sizes and designs, and they will surely be hand painted with some Egyptian motif. One of the best places to buy at a low price is in the Khalili market in Cairo, where you will find a variety of them. Even if you do not intend to smoke through them, they are great items for decoration. Egyptian crafts have a long tradition, since ceramics have been made here since Ancient Egyptian times. Some of the most common ceramic products are the figures of ancient pharaohs such as the bust of Tutankhamun or Nefertiti. You can also find figures of the Colossi, as well as ceramics tiles depicting scenes from Ancient Egypt. Clay is another of the materials most utilised by artisans, so it is also common to find small replicas of the pyramids made of clay. Throughout the country, especially in the small towns that dot the banks of the Nile, you can find houses with craft stalls outside. Papyri are one of the most famous products of Egypt due to their history, tradition and popularity. Formerly, this was the material used to perform important deeds of society and was exported to other countries. Papyrus often feature numerous hieroglyphics where scenes of the daily life are recorded, imagery of the Egyptian Gods and notes about important events. In fact, thanks to the conservation of these ancient papyri, today we are able to know how the pyramids were built. In Egypt you can find printers and shops where you can buy papyri with typical motifs or even with your own name. We recommend avoiding those that are sold on the street, as many of them are fake and of poor quality. To know if a papyrus is authentic you can pass a wet finger on its surface and, if the water does not pass through, it is good quality. This is the original dress of the Egyptians: a traditional Arab tunic that covers the body from the neck to the feet. Traditionally men's is usually white with some red motifs on the neck, while women can choose from a wide range of colors and embroidery. Depending on the material, wool or cotton, as well as its design, the price can vary. On a trip to Egypt, visitors often attend a djellaba party, which is why it is one of the most consumed products in the country. They are available to purchase in many of the textile shops that are located in the towns near the Nile, as well as in the more traditional shops in the city of Cairo. One of the most sought after products by travelers in Egypt. Many of the streets of the great Egyptian cities like Cairo or Alexandria are full of perfume shops. On guided tours it is common to stop at some of the perfume houses that are scattered along the road. The most advisable thing is to buy it in these type of shops, since they often offer you a guarantee that it is an authentic perfume and not watered down. One of the best known is Alamir Perfumes Palaces, famous for its scent called ‘Secrets of the desert’. 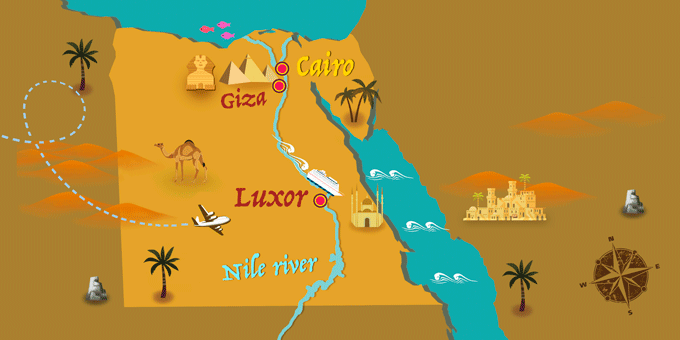 It is located near Giza and is authenticated by the government. Goldsmiths have a long tradition in Egypt, because in ancient times the jewels were used for religious purposes and to ward of evil spirits. Although initially very basic materials were used, after the discovery of desert quarries, some precious stones like turquoise and agate began to be embedded in the metals and gold pieces began to be manufactured. Jewelry was not used exclusively for personal beauty purposes, but also applied to tombs, crowns and accessories. Today, these jewels are one of the most precious souvenirs for travellers to Egypt. If you want to buy gold, it is best to do it in the markets of Gamee Plaza or in the jewellers located in Maadi or Zamalek neighborhoods, in Cairo. In Khan El Khalili there are also a large number of goldsmith shops, although not all the pieces sold are of good quality.